This was the wall entry for the 3rd round for the W.A.R. and it was intended for "The Final act" theme depicting of the tragic ending. I picked the mecha from Neon Genesis Evangelion because the whole anime series comprimises on teen depression, loss, unattached emotions, bloodlusted cold killer thoughts of homocide and the bittersweet memories it hooks up on the whole story. 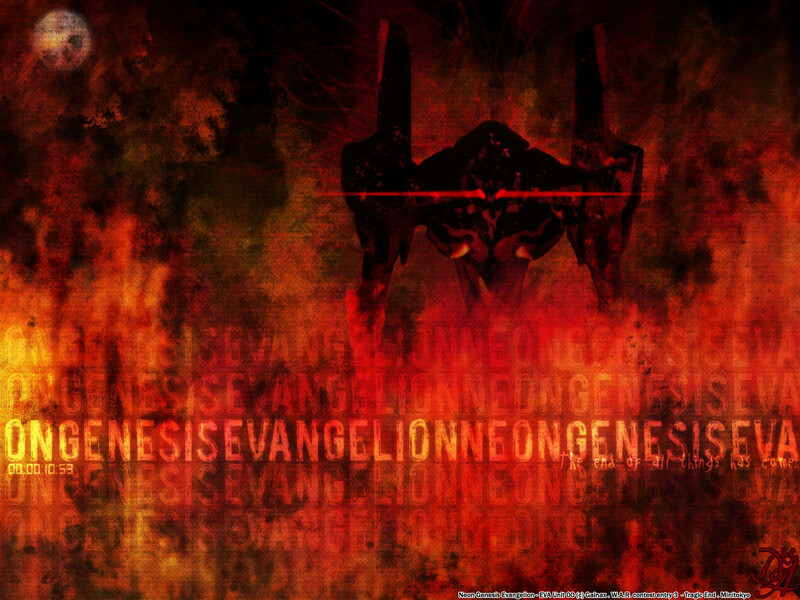 I added a burning effect grunge to depict a burning city where the EVA unit was going on during the series i fairly remember, and later knocked it off with random overlayed text. Amazing text work and grunge as always. This is one of my fav WAR entries so far. Exce;;ent eva. wallpaper; everything i would expect from one of ur wallpaper. wow...the red the red! u are really good! the grunge is really nice! ovely but not quite original. Use of text is perfect, texture is fitting and blend work well done. Good job. your walls never cease to amaze me in how well they get across the emotions you're trying to portray. i think thats what i love most about them. i like the triangular compisition and the whole mood of the wall. everything works really well together, but what ties it all together for the final blow is the text. excellent job with the text. all the walls that are coming/came out of the W.A.R. contest are just beautiful. i'm also beginning to see the same for the DERKA competition. i like contests because they always bring the best of the abilities of the wallers out. AHAHAHA cool! so damn cool! Eva! uhu! this one is really great... you know, first I thought it was a Mudvayne song title, but it`s not and well, this title got very weel with the wall... and the eva! XD hehe a great one, and a MUST for download Oracle! Congrats about this one and keep them coming! it looks like the robot is being engulfed by the flame. hehehe OA is always great with texture. the text looks really good....only that i am not quite able to read the "the end of all things has come" becoz of the redness in the bg. Fazia tempo qu naum entrava aki e esse foi o primeiro de muito temp , parabens! that's an amazing job, thank you!